Supporting the WELL Building Standard™ (WELL) goal to optimize building performance for human health and the environment, and projects pursuing WELL Certification, the ROCKFON business shares its recommendations for creating comfortable interior spaces through Optimized Acoustics™. Contributing to successful, acoustical office designs, ROCKFON Alaska®, Color-All™, Koral™, Tropic® and Sonar® acoustic stone wool ceiling panels help meet shorter reverberation times; and higher Noise Reduction Coefficient (NRC) values, even exceeding 0.90. WELL is a performance-based system that measures, certifies and monitors features of the built environment that impact human health and well-being in new and existing office buildings, their cores and shells, and their interiors. Currently in Version 1.0 (v1), Feb. 2016, WELL examines seven concepts: air, water, nourishment, light, fitness, comfort and mind. ROCKFON ceiling systems can contribute to several Optimization Features detailed in the Comfort section of WELL v1. The WELL concept of Comfort seeks to "create an indoor environment that is distraction-free, productive and soothing. Solutions include design standards and recommendations, thermal and acoustic controllability, and policy implementation covering acoustic and thermal parameters that are known sources of discomfort." "Personnel costs in commercial buildings significantly outweigh the costs for design and construction and maintenance and operations. ROCKFON Optimized Acoustics and ceiling systems can reduce costs and add value, and ultimately, improve human wellbeing in office buildings," says Gary Madaras, PhD, acoustics specialist at the ROCKFON business leading its Optimized Acoustics program. • Feature 78 calls for maximum Reverberation Times (RT60) to decrease stress and maintain comfortable sound levels through the use of sound-absorbing materials. Conference rooms are specified at 0.60 seconds and open office spaces at 0.50 seconds, which follows the trend toward more stringent absorption criteria. • Feature 80 also requires spaces to incorporate absorptive surfaces to help with reverberation management and improve privacy and acoustic comfort. It refers to using ceilings with high NRC values to achieve this. 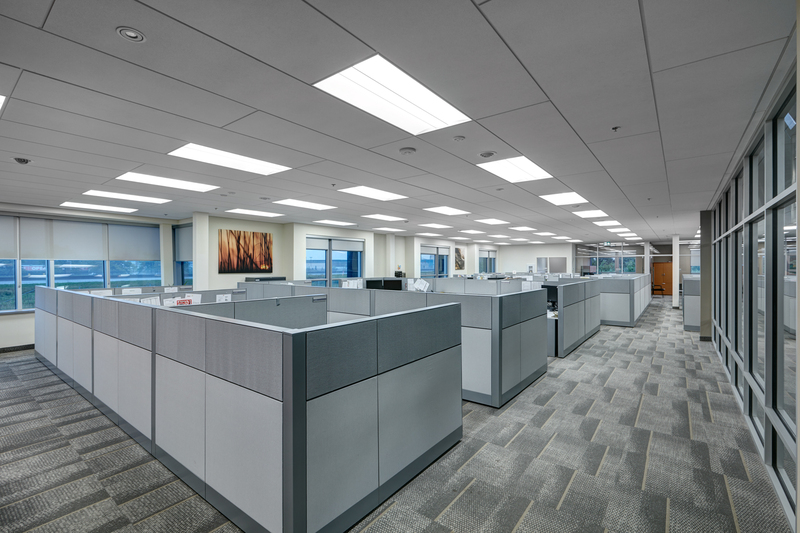 Open office spaces need ceilings with a minimum NRC 0.90 for 100 percent of the ceiling. Conference and teleconference rooms need ceilings with a minimum NRC 0.80 for at least 50 percent of the ceiling. • Feature 81 addresses noise from adjacent spaces using sound barriers to reduce transmission. – Noise Isolation Class (NIC) is the field measurement of total sound isolation between two rooms, specified by WELL as: NIC 40 for enclosed offices without sound masking; and NIC 53 for conference and teleconference rooms or for private offices with adjoining walls. NIC is similar to Sound Transmission Class (STC) values, which are laboratory measurements of the wall construction alone. – Also part of this section on sound barriers, WELL notes that all interior walls enclosing regularly occupied spaces be properly sealed along the top and bottom tracks. This commonly would be interpreted as using full-height walls and preventing noise leaks to isolate sound between adjacent spaces. Supporting projects pursuing WELL Certification, the ROCKFON business offers its Optimized Acoustics program and an extensive portfolio of ceiling systems for optimizing the acoustic experience of commercial interiors, including sound-absorbing ceiling panels, baffles and islands. To learn more about how ROCKFON products may contribute to achieving the Optimization Features for WELL Certification of New and Existing Interiors, please email cs@rockfon.com, call 800-323-7164 or visit OptimizedAcoustics.com. Note: The ROCKFON business and its products are not affiliated with or endorsed by the International WELL Building Institute or the WELL Building Standard. To learn more about WELL, please visit www.wellcertified.com/well.